Due to high ceilings, winter months of Dec.thru Feb. can cause house temperatures to be cold. Propane space heaters are located in the bedrms, TV room and open living/dining rm. area. Tennis courts available for use in town. 2 golf courses located 15 minutes from centro. There are several 18 hole golf courses available just a short drive from the house. Health comes first, and you'll appreciate our water purifying system serving all water taps in main house and casita which can be included. This wonderfully designed home offers all the finest amenities. Enjoy night swimming in our solar heated pool and spa most times of the year. The regulation pool table in the cabana is great fun. Our detached, private 1 bedroom casita can be rented separately or in conjunction with the main house. It has a delightful upper terrace for sunset views and is well equipped and very comfortable. Full cook/housekeeping service is included 5 days per week. Our covered 3 car garage offers safety and offstreet parking if you're driving. We loved the house. The location is perfect just a couple of blocks from the Jardin. The owner is very pleasant. It was our understanding from the description on the internet that we would have daily maid service and that the maid would be available to prepare one meal a day. We were disappointed when we arrived to discover that the maid was ill and not available. The owner changed the linens and cleaned the house during our 9 day stay. What a gorgeous home! With three king-bedded bedrooms and wonderful en-suite baths (plus two half-baths), it is the perfect place for three couples. The architectural features are beautifully executed: canterra, boveda ceilings, two outside terraces, gourmet kitchen. A pool, an outdoor billiard pavillion, and a hammock are pluses. Martha was on site in the separate casita, and, thank goodness, because she was invaluable in helping us with a medical emergency. The one problem we had with the water heater was addressed immediately and solved. The location is perfect - about 2 1/2 blocks from the jardin. Great location for walking everywhere. One-way short block that has little traffic adds to its appeal. Highly recommended for a lovely visit. 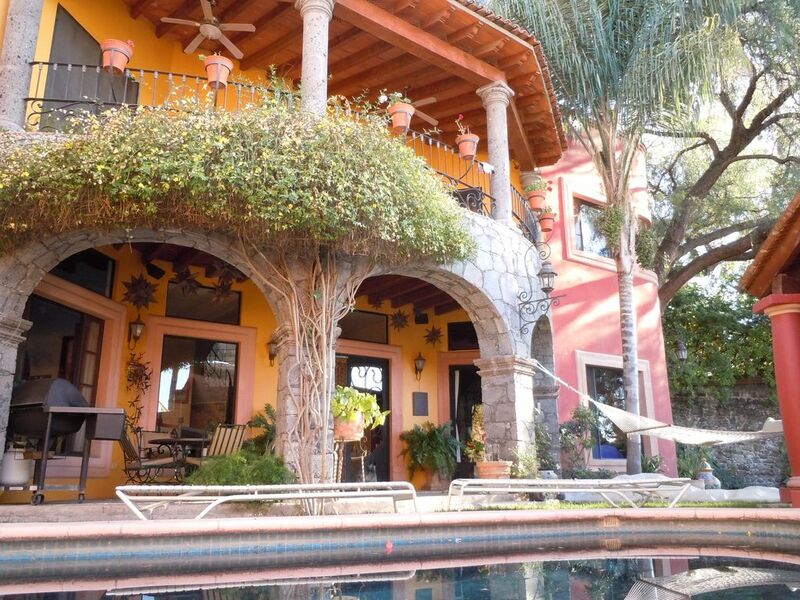 We had a lovely time staying in this spectacular home in the heart of San Miguel. Just a stone's throw away from the Jardin and all of the charming shops surrounding, we were in vacation heaven! The house itself is spacious, private and very clean. It has beautiful boveda ceilings upstairs and a lovely patio with a view of La Parroquia. Our host was kind enough to greet us and give us a tour of the home, and even walked us to a restaurant where we were to meet friends. After a long day of exploring on foot, it was delightful to return to the house and lay in the hammock, stick our feet in the pool and sip on the wine that our host was kind enough to provide us. Oh, and did I mention that a maid cleaned up after us and made our beds every day? We were spoiled to say the least. We loved our stay, would highly recommend this house! San Miguel is a wonderful city and as a World Heritage site the center city has been nicely restored. At the same time, it is a vibrant place that is totally safe and full of very friendly people. The cobblestone streets are lined with a wide variety of shops and restaurants. There is something for every taste from a simple grocery store to large markets; toys to silver jewelry; street artists to beautiful art galleries and from food carts to restaurants with white linen tablecloths. Minutes away by cab is the more gritty side of town where we also found great food and adventure all the while feeling totally safe. We experienced the finest of Mexico on every level. The house is located on a quiet street within the World Heritage boundaries and only a five minute walk from the village square. We were here for six nights without a car and easily walked everywhere we needed to go. On occasion we caught one of the many clean and inexpensive cabs. The house is spacious and exquisite in its design and furnishings. The interior finishes are first-rate in every detail with the only drawback being low water pressure. It is 14 years old but looks new. It is simply beautiful and so very comfortable. The pool and grounds are also beautiful and well kept. The owner and maid could not have been more helpful and kind. In town, tours were easily be arranged to nearby cities and attractions. On a scale of 1 to 10 this property easily scores a 10. The experience in San Miguel and in this home left us wanting nothing but to come back! You have truly characterized the charm of San Miguel de Allende. Many leave with a positive impression of their time here and the excitement of their experience beckons many to return. Great observations and many thanks for your visit. San Miguel is a wonderland of artistic and cultural activities. cuisine from around the globe a block or two from home. Weekly Rate: $2205 Rental available no longer than 2 week increments Main house 1 week minimum ...$2,200. Monthly $5,000 TO $6,000. With detached 1 bedroom casita with kitchen, and upper terrace with great view ....weekly $470......monthly $1,000 Christmas and New Year's.....week $2,500. Includes maid/cook service 5 days per week, gardner, and pool service. Request additional photo's! !